Traditional yet refined, this vintage A-line wedding dress has a soft train feature that will make today's brides feel magical. 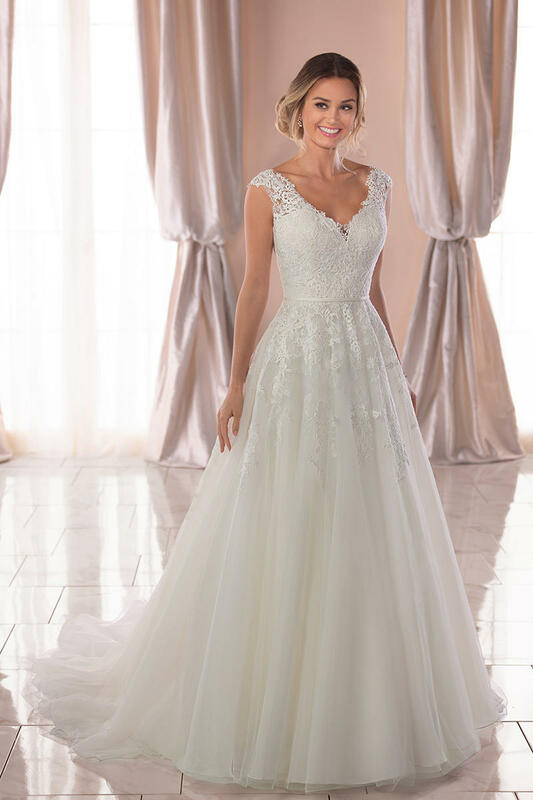 Lace, tulle, and Royal Organza come together in this classic silhouette, while a slight V-neckline is adorned with matte lace for a soft effect. The lace of the neckline extends down the bodice and over the hips, just over the top of the skirt. A mix of cotton lace and French tulle gives the sense of lightness to the dress. A full illusion lace back adds to the overall romance of this vintage style. An attached belt comes with the dress and it is also available in plus sizes.